For years I've seen apple dumplings for sale at local bakeries and they just didn't tempt me. The idea of them was appealing but what I saw looked dry and boring and I didn't get the attraction. And the couple of times I've bought them to try, my instincts proved correct. But this year I decided that, since my idea of what they should be was so different than what I was finding, I should just create my own. Now that I have, I can say that apple dumplings, at least my version, are wonderful. I used my favorite pastry recipe so there was no dry dough here. I baked the apples, with lots of cinnamon, till they were gooey and melting into the dough. And the drizzle of homemade salted caramel sauce put these way over the top. 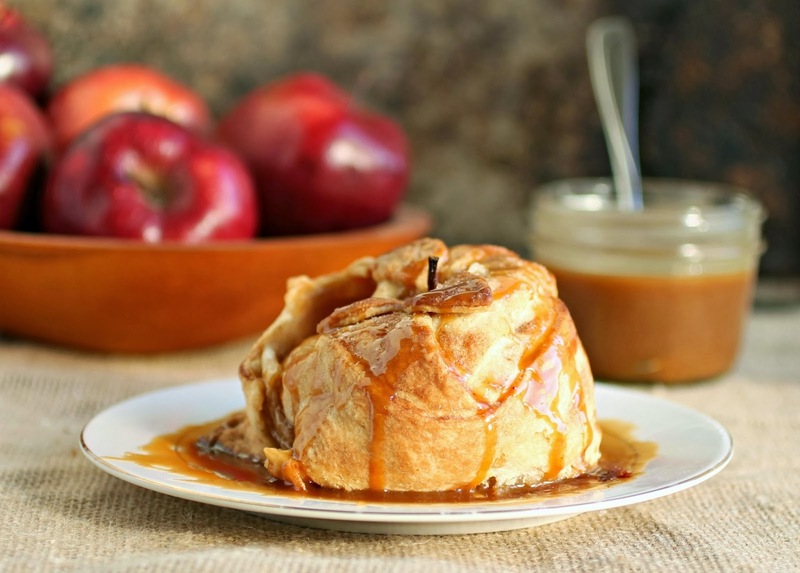 They're almost like little individual apple pies and are now a favorite treat. Enjoy! To make the pastry, combine the butter, flour, baking powder, salt and sugar in a food processor with a steel blade and pulse just until it resembles course crumbs. Slowly pour in the ice water and pulse just until combined and a dough ball forms. Wrap the dough in plastic wrap and refrigerate for at least one hour. Peel and core the apples. In a small bowl, combine the 1/2 cup of sugar and cinnamon. Sprinkle the mixture equally among the apples and add a dash of salt over each one. When the dough has chilled, cut it into four equal sections. Roll each out on a well floured surface until it's large enough to cover your size apple. Place each apple in the center of each dough round and bring the dough up to wrap around the neck of the apple. Use a bit of water on your fingers to make the edges stick. If you have any scraps you can use a small leaf shaped cutter to make decorations for the tops of the apples. Move the apples to a baking sheet lined with parchment paper and bake in a pre-heated 375 degree oven for approximately 45 minutes or until the pastry is a light golden brown. Serve warm with the caramel sauce. Makes 4 servings. These photos are fabulous. Apple dumplings are always my go to when apple picking. Wiping the drool off my chin. 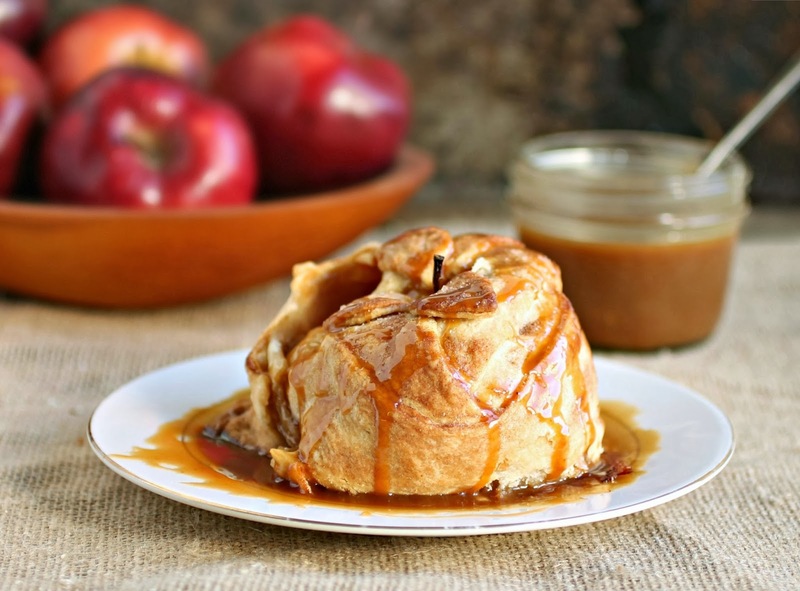 Oh my how I love apple dumplings and yours look incredible! Ohmahgaaaaaaaaw that looks incredible, Anita. I started drooling reading your description. I've never had an apple dumpling. This must be rectified immediately.